Earlier today I posted a rumor about the price and release date for World of Warcraft: Wrath of the Lich King. It came from, of all places, 7-Eleven. Turns out that the convenience chain is growing increasingly interesting in the gamer demographic. How interested? Interested enough to start tracking sales and, over the course of the next few months, to start taking pre-orders on a number of video games. Our Slurpee-sources tell us these 7-Eleven gaming facts:One out of ever two 7-Eleven customers own a gaming system. Nearly 3,200 stores had considerable Madden sales the first week of the game's release. More than 25 percent of Madden sales at 7-Elevens occurred between midnight and 1 a.m. What's that mean to you John Q Customer? Why that starting this month 7-Eleven is going to start selling the seven "highest potential games" introduced for the holiday wind up. Those games include Lich, Guitar Hero World Tour, Fallout 3, 007: Quantum of Solace and Gears of War 2. 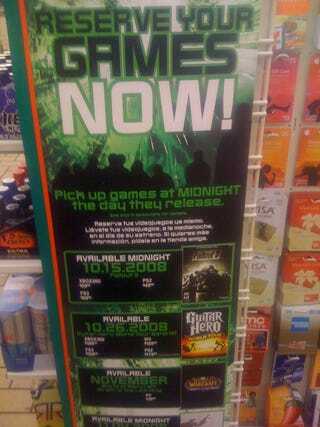 The stores will soon have point of purchase signs set up for video game pre-sales. Games will all be available at midnight on the day the game is released.